This is also true for companies. Today, the European Commission has finally agreed to the purchase of Sun Microsystems by Oracle. Russian and Chinese authorities have yet to answer to this deal, but it seems that any Monty-backed answer would be more a delay than a stop for this merger to happen. 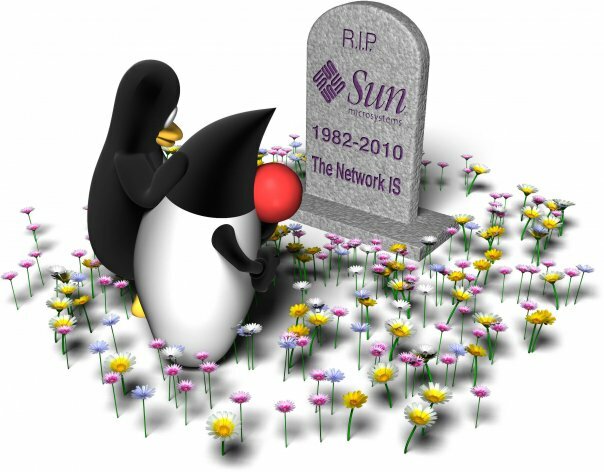 I would therefore like to say Goodbye to Sun Microsystems. It’s been great working with you, it’s been great sharing years of my life as a Free Software contributor. You were one of these IT companies who have this strange ability to make all of us dream and feel confident we could just walk further than anyone else. I look forward working with “another you”, inside the broader Oracle Corporation, and I am sure that it will be exciting. So farewell, Sun. Hopefully your employees will not forget who you were, what you stood for: excellency in technology, freedom, genius, and inspiration. My friend Simon Phipps got that on Facebook for the occasion. 4 Responses to "Every good thing has an end"
At least we have been spared Sun be turned into a zombie-troll like Sco/Caldera has been. All in all a merciful “death” and possibly some good inheritance to Freedom.